If there was one over-arching lesson from the 2017 Digital Workplace & Intranet Global Forum is that content, in all its forms, should be the apple of any digital workplace manager’s eye. It’s what employees want, and why they visit the intranet. No one goes to the digital workplace because they want to ‘surf’ around or have a burning need to read the latest from Corporate Communications. Employees access the digital workplace, usually via the intranet home page, to get something very specific – often a policy, form, or document. And employees want what they want as fast as possible. They may glance at home page news along the way, but it’s very specific content that they’re after. 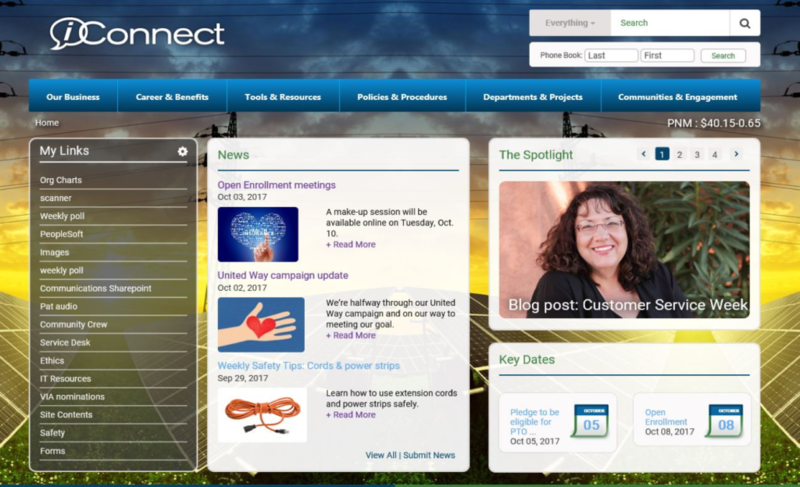 PNM Resources is a medium-size power generation and transmission company in New Mexico and Texas with some 2700 intranet users of their enterprise intranet, iConnect. With only one part-time manager / editor, the internal communications manager, the company benefits from a decentralized content model that deploys SharePoint 2013 as a central content management platform. The model and platform are supported by a central, comprehensive enterprise governance model and content management plan, and a decentralized content publishing model with dozens of content writers and publishers. As part of the redesign and deployment of a new intranet, led by intranet consultants Prescient Digital Media, the pre-program for the launch of the new intranet last year included five months of content training, migration, testing, and tweaking, before the new intranet portal went live to all employees. An examination of the intranet revealed that a majority of content on the old intranet was no longer relevant or suitable for the new intranet. The strategic decision was made to not bulk migrate any content from the old intranet, but rather to train and support content owners to own their own content, and to manually migrate only the most relevant content. However, content was important, in fact, critical to the entire process. In fact, PNMR spent five months between the beta and full site launch to allow the necessary time for training, tweaking and content publishing and migration. And it paid-off: the new intranet launch was a resounding success with rave reviews from both management and employees. Additionally, with a lack of staff to create home page news, a program was created to encourage all employees to submit news and stories via a “Submit News” link below the News section on the home page. Not even a full year since launch and 15-20 news stories are submitted by employees every week, news stories that can also garner several dozen user comments, and high employee engagement. Weekly “quick polls” have also further engaged the target audience: on average, about 10% of all employees take the weekly poll. Key lesson: it takes a village (company) to create content. Cigna is a worldwide, US-based, healthcare organization with more than 41,000 employees. Despite its large, Fortune 500 status, more than 25% of employees work from home. To stay engaged and connected with other employees, and to share best practices across the enterprise, many have become active bloggers. In fact, amazingly, Cigna has more than 12,000 active employee bloggers and readers. To gain active participation from employees, Cigna had to promote and prompt involvement, a process of several years. Clearly, change management, not the technology itself (the blogging platform uses the out-of-the-box SharePoint blog functionality) , has been key to garnering participation from employees. And employees are engaged: the average employee blog post generates 4-5 user comments. One blog post that I viewed had 60 user comments. And not all the blog content is business focused. 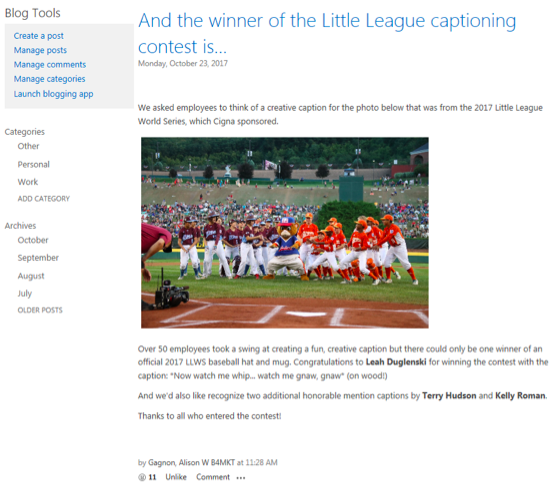 Some blogs are more formal with a business focus, others are lighter fare intended to engage employees, such as one that encouraged employees to submit “a poem that rhymes with orange” (which garnered more than 300 employee submissions). In fact, business content only comprises one-third of blog posts; community-related posts make-up one-quarter of all blog posts; personal blog posts comprise 42% of all employee blog posts. Key lesson: combining business content with social content engages employees. Bayer is a massive pharmaceutical, health and life services company with more than 115,000 employees worldwide. The US organization has some 12,000 employees, and had a sprawling intranet with more than 350 employee sites. Intranet sprawl is common where there exists a lack of governance and standards, and where different departments and organizations are left to their own devices. And Bayer listened to the usual feedback and complaints from managers and employees: the intranet was not the preferred communications channel; information was difficult to find; and many found the intranet “overwhelming”. The mega life services company needed to clean up the intranet sprawl, and standardize on a single platform. Among the key drivers for doing so was the need for a consistent user experience, a single technology platform, and single communications and messaging experience (and increase the reach of strategic messaging while promoting more two-way dialogue with employees). 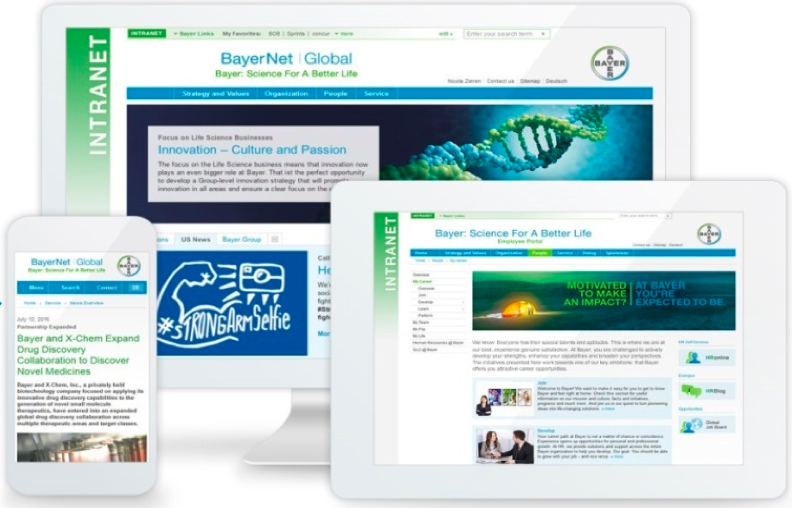 Bayer US consolidated more than 350 intranet sites onto a single platform, Sitecore, using IBM Connections for social collaboration, and in doing so have enhanced their employee communications, and saved $4.4 million per year as a result. 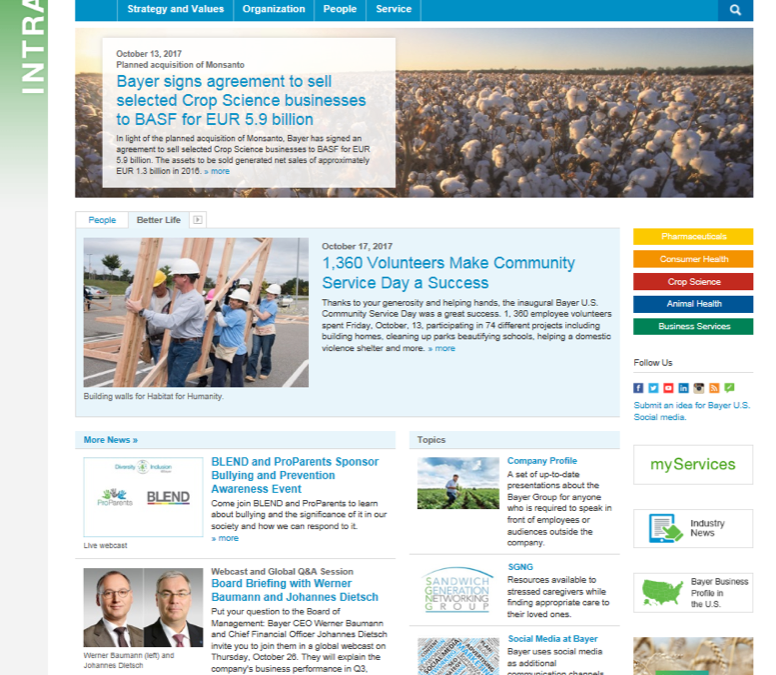 Bayer takes a customized, personalized user approach to the home page with a combination of global, regional and local content and news. The user has the option to customize the content delivery by company, business unit, country and local site (office or plant). The new standardized, customized approach has significantly improved employee communications and intranet use is up 250% since its launch last year. But a change in technology and governance alone was not enough to drive use and adoption; Bayer credits their change management program with ensuring intranet success. Among the change tactics they adopted were office hour training sessions, live “lunch and learns” engaging with admin. professionals, and seeded content that helped employees along the way. Once such helpful article is entitled “Top 10 BayerNet Questions Answered” and was presented in a Q&A format. Key lesson: employees demand a simple, single user experience across the digital workplace. Google is breaking the digital workplace and intranet mold. While it has a central intranet portal, called MOMA, the portal has become increasingly decentralized, and decreasingly important in the evolution of a new, emerging digital workplace. With an emphasis on a decentralized approach with a heavy reliance of their own cloud tools such as Google Docs, you can imagine the emphasis and reliance on search. At no other digital workplace will you find such a reliance on search to find information to do one’s job. If you’re one of 100,000 Googlers needing information for your job, you go to the internal Google search to find what you need. Google search is of course their internal search engine, but they’ve augmented it with a machine-learning option. Employees can now search “unexpected sources” with machine learning called Explore, from within a Google Doc. When the Explore option is on, related content from other sources will be highlighted via drop-down menu. The machine learning Explore option allows Googlers to research or even borrow content from other sources, without reinventing the wheel. And ‘borrowing’ content from other Googlers is not only common place, but encouraged. Jana adds that Google consistently “eats their own dogfood” every day. 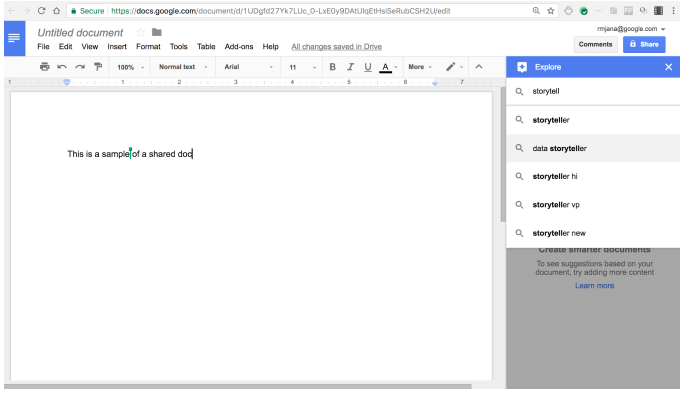 So while Google Docs and Google Sites can be used by anyone on the Internet, Google employees use those very tools every day on the intranet, and its the focus of their digital workplace. When all content is being created in a decentralized, ad-hoc manner – all in the cloud – the challenge becomes one of consistency and standardization. The model is, in fact, self-policing, and creating appropriate content is par-for-the-course. In addition to regular content, video content is increasingly important, and a part of every meeting. Key lesson: true collaboration doesn’t come from the top, but the bottom-up.